Hey all, has anyone experimented with Face.com for facial recognition with QC? I've been attempting to get NetworkTools to post image data to the Face.com API, with not much luck. I'm pretty sure I'm doing something wrong though. Can anyone take a look at this comp? I've included my API key & API secret for ease of development, but after a couple of days I'm going to revoke it and generate a new one. Kineme NetworkTools does not use Query Parameters if the Content-Type is changed from "application/x-www-form-urlencoded", but to POST data properly to this API I should be using "multipart/form-data", correct? From the API documentation it looks like there are 2 ways to send the request -- either put an image URL in the query parameters, or use multipart/form-data and put actual image data in the POST request. ... 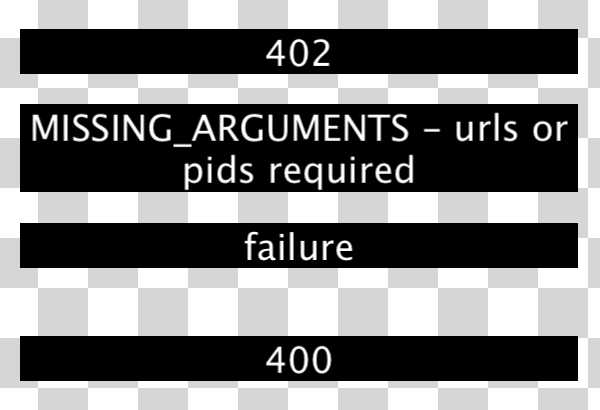 I noticed that even with a valid-looking multipart/form-data string, the response has the error "MISSING_ARGUMENTS - api_key is missing". So I tried it outside of Quartz Composer. I put some POST data into a text file and did curl -d @post.txt http://api.face.com/faces/detect.json. Same error. So, if you can figure out what a valid POST request looks like, and get that working with curl, we can help you get that working with NetworkTools. field and just get the contents for that text field from a file. To read content from stdin instead of a file, use - as the filename. This goes for both @ and < constructs. Amazing what happens when you read the MAN page :/ The "@" is definitely important as well in this case for curl. curl trace.txt -F api_key=8e7bfe8565ae1ae9a8f7ca279d8d5cf2 -F api_secret=d568480ede4ec34a49d802134b1d8b82 -F media=@face.png "http://api.face.com/faces/detect.xml"
So you can pass the API key and secret, not just the image, inside the POST. And if you add the flag --trace or --trace-ascii, you can see the text of the POST request. Thank you. That gives me enough to go on. This week I'll add some patches to DataTools to make the NetworkTools POSTing actually useful. @mattgolsen, I made some progress and will hand it back over to you. You'll need the new beta version of NetworkTools and the latest version of DataTools from GitHub. The attached composition does not quite work. It seems to be sending the API key and API secret correctly via POST, but not the image. The error from Face.com is "INVALID_ARGUMENTS_VALUE - Upload error - The uploaded file was only partially uploaded". curl --trace -F api_key=YOUR_API_KEY -F api_secret=YOUR_API_SECRET media=@face.png "http://api.face.com/faces/detect.xml"
-- with the output of tcpdump while running the composition. I've looked at it for a while and I'm not seeing any meaningful differences between the two. If you can figure out why it's not working, and it's a problem with NetworkTools or DataTools, then let me know what I can do to help. So I captured a session using tcpdump and compared POSTing via curl, and then through NetworkTools. After reviewing it with WireShark I'm seeing a Header Checksum problem with the submission from NetworkTools. It returned a 404 as well as the resulting XML from face.com, but I think that's just something on our end TBH. But using the original solution seemed to work out ok.
Are you sure the header checksum error isn't some problem with how you're capturing packets?